Quick Thought: We’re Not All Jumping From Mountain Top To Mountain Top Here, People! Don’t let failures throw you off mission. We all have moments of glorious victory and stinging defeat. Like us, when Peter relied on his own strength, he failed. When he kept his eyes on Christ and relied on the power of the Holy Spirit, he was bold and effective. Don’t give up! Fix your gaze and press on! 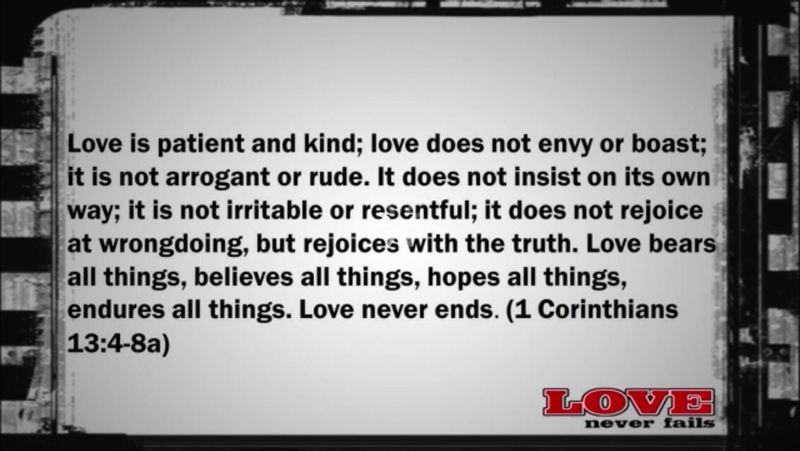 Interesting that the first thing love is, according to the famous “love chapter” in 1 Corinthians 13, is patient. Seems to be a tough one for most of us to master. And if LOVE is patient, what does impatience convey? Went on a father/daughter date to the Patriots game yesterday. The best part? Okay, the come from behind, last minute win was pretty amazing, but it can’t top the ride home. Normally, I’m not a big fan of the 2+ hours it takes to drive the few miles to 93 from Gillette–but let me explain. I had a crazy amount of work to do this weekend. I was on deadline for a project I’m working on and wasn’t even going to watch the Patriots game. Oh, I’d have it on, but only to listen to and maybe glance up during the key moments. So you can appreciate my dilemma when a friend couldn’t use his Patriots tickets at the last minute and offered to give them to me. So, being jammed for time, we got there right as the game started and my plan was to fly home after and get back to work. We had a great time, the Pats played horribly until the last quarter when they miraculously scored two touchdowns in less than a minute to win the game in improbable fashion. It gave me a great object lesson about how even when things seem hopeless, not to ever give up. It was a great first game for Arianna. The two of us persevering through the cold, together, wrapped up in a blanket drinking hot chocolate and coffee respectively. As I explained every thing that would have to happen for them to win, they’d do it. We high-fived and cheered. Ari watched her dad hug strangers. It was awesome. We talked with other fans on the way back to the car, the walk seemed like nothing. When we got to the car, still exuberant, I had a “back to reality” moment, remembering how bad traffic is leaving Gillette Stadium. I have to be honest, I was anything but happy. I didn’t whine too much, but only because I’m trying to model positivity for my kids. I was not happy about all the time I was going to lose that I could be finishing my project with. After all, I had taken the time to actually go to the game, but hadn’t thought that part through. What I didn’t realize at that moment, was how much time I’d be getting with one of the three humans I love most, my daughter Arianna. We were listening to the post game show and talking about the amazing comeback. We both issued different variations of, “I kinda can’t believe what we just saw, and yet, I’m totally not surprised” to each other. More than once, I’m pretty sure. We were being a little goofy, just having fun. Our conversation was great. 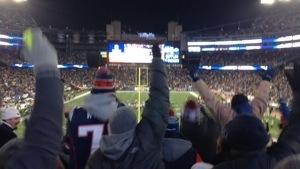 We laughed, bragged on the Pats and laughed some more. And in the midst of those smiles and laughs, Arianna asked some pretty deep questions about football and then life. She made some pretty insightful observations, about football and then life. She even shared some of her dreams she has for her life in a way that we’ve never quite discussed. I had turned the post game show down a while ago, and by that point wasn’t paying any attention to it. I was no longer thinking about the fact that I still had to get that work done. I wasn’t even upset about the traffic anymore. In fact, I kinda hoped it wouldn’t end. Two and a half hours later, we made it home. I had to stay up very late, and get up very early, to finish my work, but it didn’t bother me one bit! Awesome when God gives us what we need even when we don’t know we needed it. Like a traffic jam. This is an amazing video. May be the best thing I’ve seen all year. I could, seriously, watch this all day. 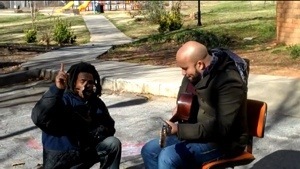 When singer/songwriter Carlos Whittaker hit the park with some friends to record an acoustic performance of God Of Second Chances, something wonderful happened. Somebody needs to get these two into a studio, quickly! Who is a God like you, who pardons sin and forgives…You do not stay angry forever but delight to show mercy. There’s a story that’s now legendary at Grace Church. One Sunday morning, when we were just a small gathering, a homeless man walked in during worship. Moved by what he was hearing, he walked onto the stage, pulled out a harmonica and joined the song in progress, not missing a beat. Sooooo wish we had that moment on video. Let’s keep Danny in our prayers. And remember that everyone we encounter was created in God’s image, and is loved dearly by the God of the universe. Let that inform how we treat the people we come across today. Thanks to my niece Tabitha for sharing this video with me! DVR Alert: “Billy Graham: My Hope America” 10pm Tonight!